The Deanery is a two-storey brick building built in 1859 as a residence for the first Dean of St George’s Cathedral, George Purvis Pownall. The site of the Deanery was near the site of the old Perth Gaol, where Aboriginal prisoners had been held, and Yagan‘s father, Midgegooroo, executed. It has also been claimed that the town stocks once stood in the grounds of the Deanery. Even with this history, the eastern end of St George’s Terrace was a fashionable residential area. The Deanery was in keeping with the nearby homes of affluent colonists, and shows the style of colonial architect Richard Roach Jewell. He was the only qualified and experienced architect in the colony and his buildings include the Town Hall, the Pensioners’ Barracks, Treasury Buildings, Trinity Congregational Church, Wesley Church and the old Courthouse and Gaol. The Deanery was used as a residence for more than ninety years, until 1953 when it was proposed that it be demolished and replaced with a ten-storey office block. However, following public protest, the building was retained, modernised and converted into a combination of office and residence. In the early 1980s, an extensive program of restoration and conservation took place, including restoring the original garden. Following these works, and continuing to the present, the Deanery has been used as the Cathedral offices. 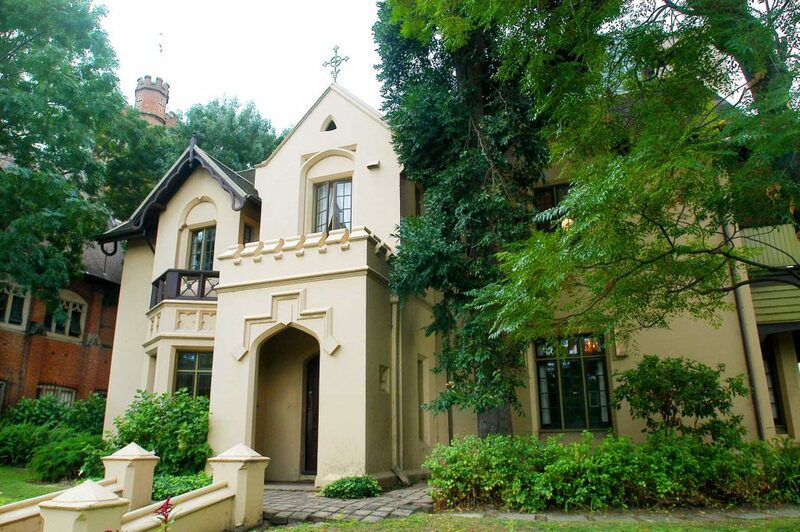 The Deanery is a two-storey brick building built in 1859 as a residence and office for the first Dean of Perth, George Purves Pownall. Pownall had succeeded John Wittenoom as Colonial Chaplain and, following the consecration of Mathew Blagdon Hale as the first Bishop of Perth, Powell became the first Dean of St George’s Cathedral. The site of the Deanery was formerly the site of the old Perth Gaol, but the land was exchanged with the Crown in July 1858, so that The Deanery could be close to the Cathedral. There was some controversy regarding the exchange as the Gaol had been used to house Aboriginal prisoners, and it is claimed that Yagan‘s father, Midgegooroo, who was captured in May 1833, was executed on site. It has also been claimed that “the Town Stocks once stood in the grounds of the Deanery”. Even with this history, the eastern end of St. George’s Terrace and Adelaide Terrace was a fashionable residential area. A regulation promulgated in 1833 required owners of lots in this area to build homes costing at least £200. At a cost of £900, The Deanery was in keeping with the nearby homes of affluent colonists. Twelve white mulberry trees, planted by Wittenoom and known as the twelve apostles, grew in front of the Cathedral and The Deanery. A large garden with trellises of grapes and other fruit linked the Deanery with the Cathedral. Pownall had a keen interest in architecture, and this interest was to substantially influence the design of the Deanery. He was a member of the Ecclesiological Society and he had been a member of the Camden Society at Cambridge, whose adherents strongly advocated the Gothic style for residential as well as ecclesiastical buildings. The Deanery exhibits a number of attributes of this style of architecture which have been attributed to Pownall’s influence, although the architect responsible for construction was Richard Roach Jewell. Jewell had arrived in the colony in 1852, and soon afterwards was appointed Foreman in the Public Works Department. He was the only qualified and experienced architect in the colony and subsequently became Superintendent of Public Works. His buildings included the Town Hall, the Pensioners’ Barracks, Treasury Buildings, Trinity Congregational Church, Wesley Church and the old Courthouse and Gaol. 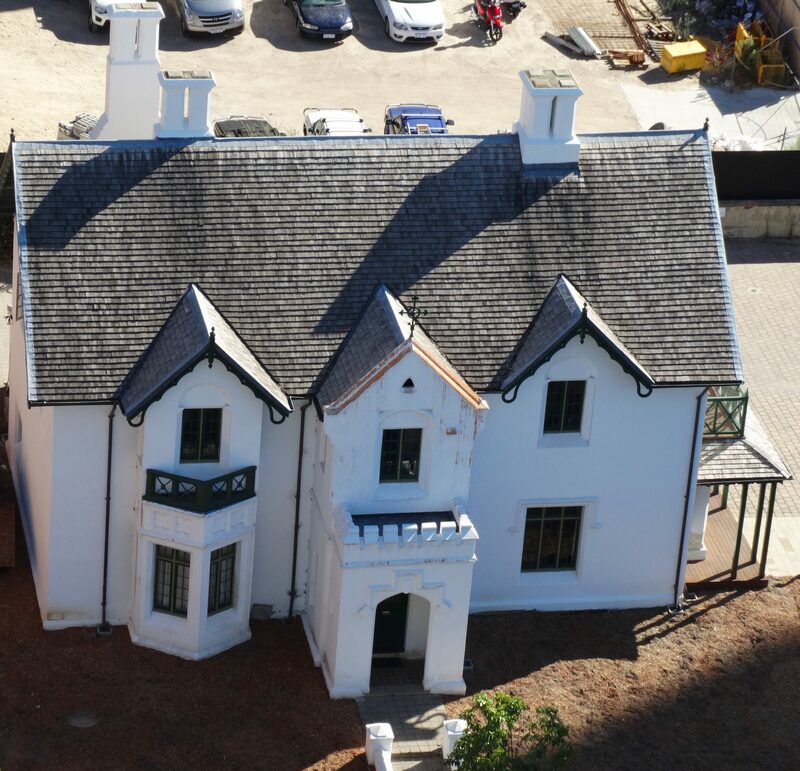 Nearly all his buildings in the central Perth city area are in the style of simplified Colonial Gothic with a strong Tudor influence. The Deanery has a relationship with these buildings, but it is uncommon in Perth in its close adherence to a standard design from an English pattern book of the period. In a letter to the Colonial Secretary, Pownall wrote: “The whole expense of carrying out the excellent plan prepared by Mr. Jewell would be about £900.” The cost of the building was met by the Government paying £300, public subscriptions raising £300, and the Anglican Church contributing £3007 with bazaars and other fundraising activities held to raise money. The men employed to build The Deanery were convicts who had been granted a ticket-of-leave to obtain employment with free settlers in the colony. Hale and Pownall abhorred convictism, but they believed that the system would eventually foster moral reformation by showing the convicts the error of their ways. The employment of ticket-of-leavers on the construction of The Deanery and Bishop’s House reflected their views on convictism and self-help. Progress on the buildings was reported in the Inquirer and on 4 November 1859, it was advised that “the Dean has moved into the Deanery”. 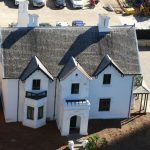 The appeal was successful and the Deanery was modernised and then used as part office and part residence by the Dean’s secretary and by the assistant priests and their families and verger-caretakers. 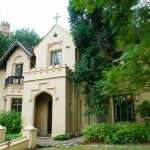 In 1979, the Deanery was again in need of restoration as its condition had deteriorated, and an appeal was opened with the aim of raising $90,000. $95,736 was raised, of which $69,488 came through the National Trust. An extensive program of restoration and conservation, including an attempt to restore the garden to a resemblance of the original garden was undertaken under the aegis of conservation architect Ron Bodycoat of Duncan Stephen and Mercer. Following restoration, the Deanery was opened to the public on 8 May 1982. Since then it Deanery has been used as the Cathedral offices.